It’s a familiar story: the decline of a great but flawed man. Ibsen’s The Master Builder is one in a long line of plays about the decay of male ambition and power, from the tragic heroes of Greek drama to the everymen of Arthur Miller. But in her new version for West Yorkshire Playhouse, Zinne Harris shifts the lens, examining the harm caused by men such as Ibsen’s Halvard Solness. 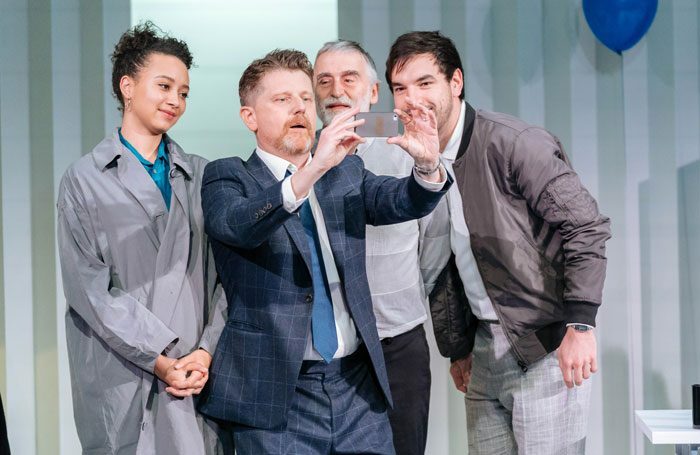 In James Brining’s elegant production, the play has been shunted into the present day, where Solness is the award-winning owner of an architectural firm. As he prepares for the unveiling of his latest big project, due to be opened by Prince Charles, the arrival of a mysterious young woman from his past begins to shatter Solness’ fragile success. As Solness, Reece Dinsdale makes an unpleasant character grimly compelling. Ruthless swagger is increasingly contaminated by fear, as first youth then his unsavoury past threaten to ruin him. Meanwhile Alex Lowde’s stylish grey design has hidden surprises, closing in on Solness as the sleek illusion of his perfect life unravels – though the initial shift beyond realism is clunkily managed. Ibsen’s play is famously enigmatic, inviting different readings of its central character. Here, though, there is no room for doubt. In unpicking the myth of the tragic male protagonist, Harris has stripped away ambiguity, eventually making Solness into a straightforward monster. The tacit abuses carried out by powerful men are strikingly exposed, but a certain amount of nuance is sacrificed in the process.